Whoa whoa whoa holidays. Slowwww yourrr roll pleassseeeeee. Ok, go that out of my system. Seriously though, I am very happy this is the end of the year, and I am giving myself that two week vacation. I am struggling to get all on my list finished before that date, and what should take two hours, is taking three. Even after an amamzing weekend of relaxing for my birthday. I waited too long for a long vacation, learned lesson and will not be doing that again, ever. In my past life, my massage therapy business, I took at last one week off every three months. Everyone hated and loved that about me! I needed it, it was an actual necessity to be a super awesome successful therapist. My body, mind, and soul needed that break from taking care of people, and my body, well that goes without saying. I did major therapeutic, deep tissue massage, so the body was like, TAKE A BREAK. Plus I tore a ligament in my wrist from so much detail massage work, and from then on, I took a week off to recoup my efforts for fixing others. There is point here, I swear. So fast forward four years later to where I am sitting now at this very moment. I have been working in kitchens, went to culinary school, and made blogging a career. I have not made the same effort to taking time off, and now I need to. I am finding I don’t need as much time, but for sure as often. So every few months I’ll take a long weekend so I don’t run into being too tired or drained to write, make, and share. This is the time of year where I love sharing so much knowledge to help others make and create, so I want to be my best for you, and that means taking extra time off to recoup, even in this job. And as far as recipes right now, they need to be easy, tasty, beautiful, and make our tummies happy. We should always be grateful and share time with loved ones. So at a time that we put more emphasis on it, like the holidays, let make recipes that we can make together, and don’t take as much time in the kitchen! That way we can get to the vacation, family time, and curl up with a good book while snacking on these treats. It is, in fact, a treat to have a savory delectable puff pastry bite with a nice glass of wine, a fire, and book. These take no time to make, so I am loving this recipe for the holidays! What are you making for the holidays this year? Place oven rack in center of oven, and preheat to 425 degrees. 1. Place puff pastry dough on a parchment lined baking sheet. Spread hummus evenly on dough, leaving 1 inch border all the way around. Add onions in an even layer, then mushrooms. Drizzle with olive oil, and balsamic vinegar. Sprinkle with a pinch of salt and pepper. Place in oven and bake for 20 minutes, or until crust is golden brown. 2. While puff pasty is baking, cook bacon, then drain on paper towel lined plate. Chop into small pieces. 3. Remove pastry from oven and allow to cool for 15 minutes. 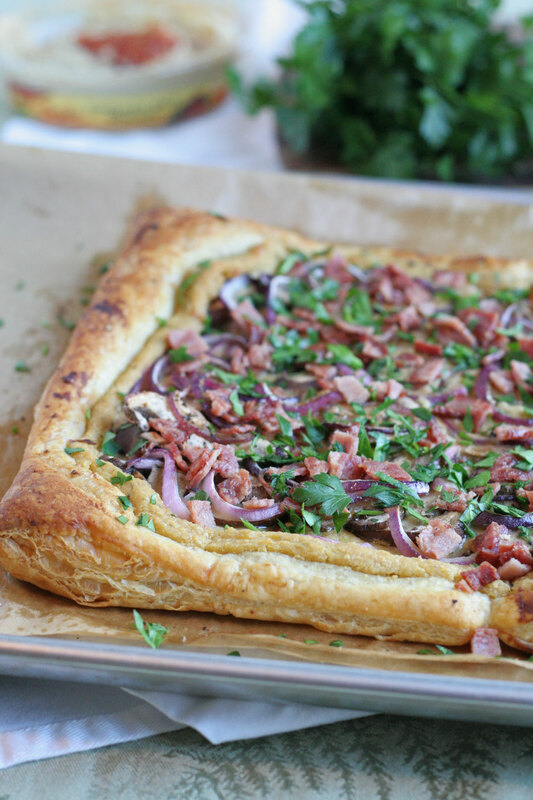 Sprinkle with bacon, then parsley. Slice and serve as an appetizer, or as a weeknight easy dinner with a salad. I didn’t know you were a massage therapist in your past life! I agree with taking time off! I just went full time blogging this summer and am learning that quickly. Can’t wait to take some time off as Christmas gets closer. 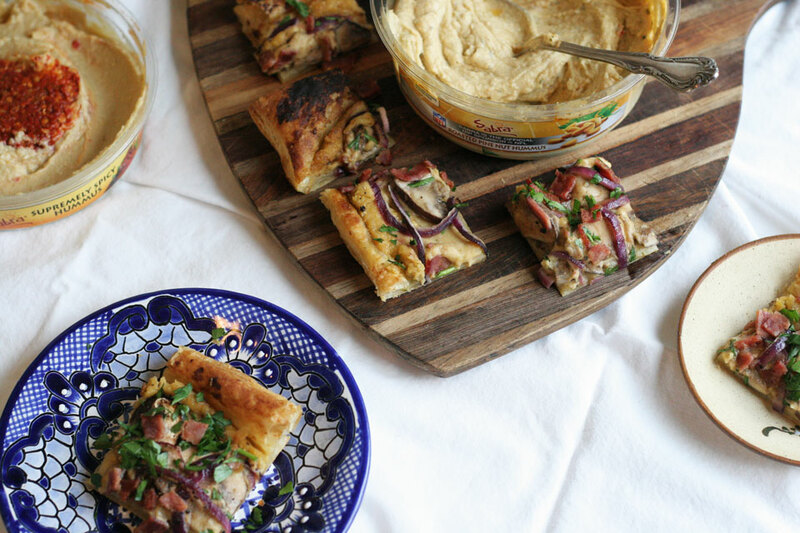 Sabra Hummus is my favorite, especially the roasted garlic, so I need to make these puff pastry bites! I stopped reading after bacon – that looks amazing. Oh my goodness. Just…all of that. I love Sabra! Pinned. The onion bites look amazing!!! You had me at bacon. And hummus. Well, the whole thing, really! 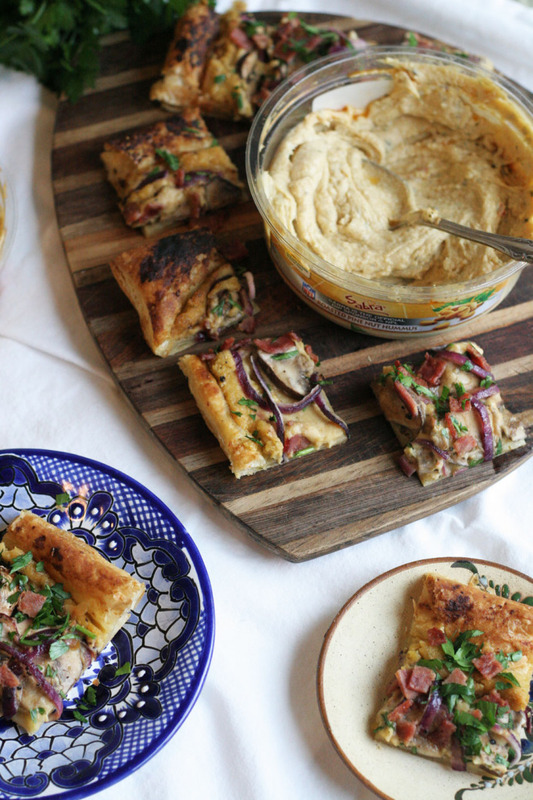 Puff pastry, bacon, hummus…doesn’t get much better! Looks wonderful! This looks amazing! Such a amazing flavor combo! This would be a perfect appetizer for a holiday spread – fantastic combo of flavors! Thank you, Faith! And so easy to make. What a delicious nibble! Simple enough for the holidays, yet elegant enough for company! This pizza is amazing and I love the flavor combo. Looks delicious! I love Sabra Hummus! Thank you, Nicole. Me too, it makes some meals super fast and filling.